Where were you on September 9, 1994? At the Rolling Stones concert at Spartan Stadium, of course! That night, 46,000 MSU students, alumni and community members attended the first ever rock concert at Spartan Stadium – the Rolling Stones on their Voodoo Lounge tour, with Lenny Kravitz opening. The only other concert held in Spartan Stadium was seven years later when U2 performed for more than 65,000 fans on June 26, 2011. Renovations to the stadium were completed just in time for Stones concert and included a new tunnel large enough for trucks to haul in the stage and lighting. When assembled, the stage was 92 feet tall and 220 feet wide, stretching across the entire north end zone. “The set was pretty amazing. There were massive balloons that dwarfed the stage. The Rolling Stones, and their backup singers, were phenomenal,” remembers University Archives cataloger Susan O’Brien. Fireworks accompanied the final song, and the Stones sang their classic Jumpin’ Jack Flash as an encore. Video footage from the Rolling Stones concert was recently discovered among the Archives’ film and video holdings, which we’re digitizing with help from our many supporters. Your gift to the MSU Film and Video Preservation Fund will preserve valuable footage like the Rolling Stones concert and our treasured history of Spartan athletics and campus events. To contribute to the MSU Film and Video Preservation Fund visit archives.msu.edu/giving. Photographs of the concert and a set list can be viewed on our On the Banks of the Red Cedar website. The first Cadet Band, photographed here in 1884. In the early months of every fall semester, the familiar sounds return of the MSU marching band’s daily practice, and our walks around campus double in length as we avoid Adams Field or risk being run down by a rogue tuba player. The college has had to work diligently, however, in order to build our band to its present admirable institution. When the first attempt was made to organize a music group in 1875, there was only enough money for seven instruments. 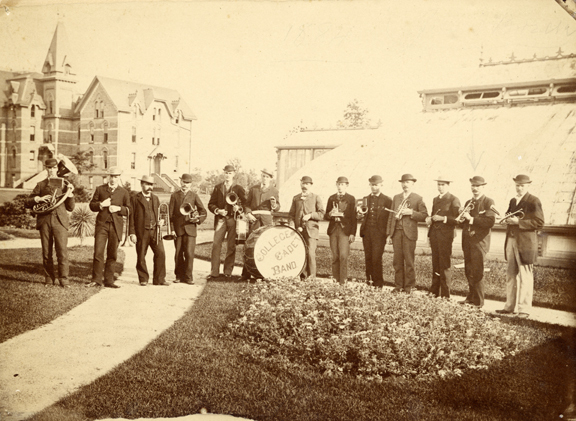 The students played for events on campus, but they also worked as a for-hire group around the area, which enabled them to expand and be able to purchase further music and instruments. 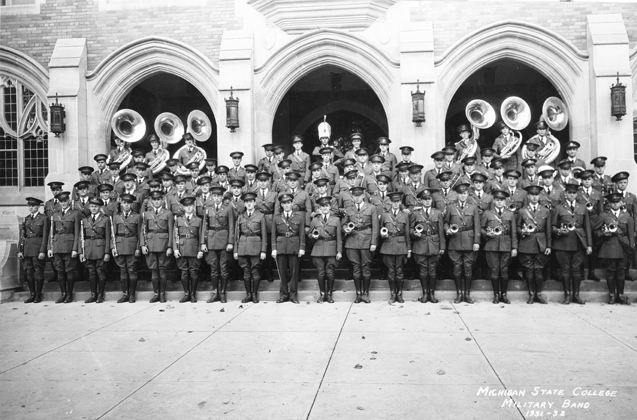 The Military Band posing in 1931.
formed in 1884, the band officially fell under its jurisdiction. That year, the first Cadet Band was organized. They provided martial music for the military students to march to, and they also played at parades and dances around East Lansing. By 1913 their numbers had grown from seven to fifty-one, including the first African-American member who joined the previous year – Everett Claudius Yates, a percussion player. The establishment also grew large enough to warrant the construction of an outdoor playing venue, which was created in the form of the Band Shell in 1938. 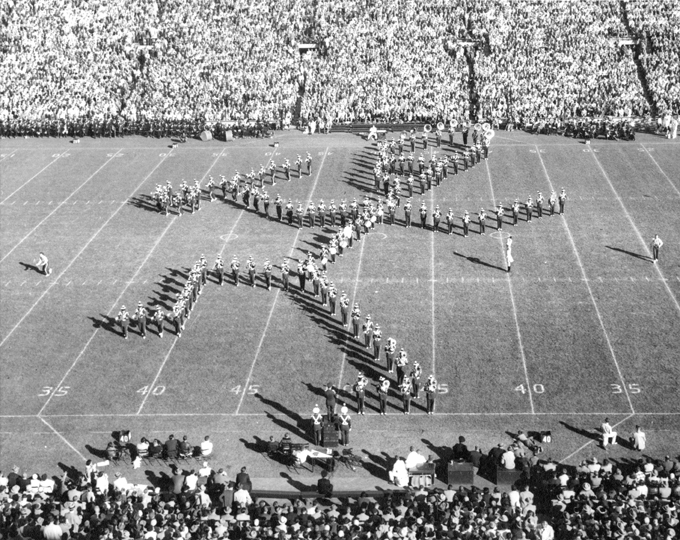 The marching band forms a stick-man during a half-time performance in 1955. With the onslaught of World War II, the nature of the Michigan State Marching Band changed. The uniforms themselves even reflected the atmosphere, bearing a rather military air about them in the early part of the 1940s. Declining numbers due to military inscription at this time were detrimental to the band’s survival, so for the first time the organization’s director, Leonard Falcone, admitted women. Falcone himself enlisted and had to spend a few years going to and from campus, fulfilling his duties around the country. MSU saw the benefits of female members: all-female bands were organized to travel around the state and provide entertainment for soldiers, and the women were allowed to remain in the music groups after the end of the war. 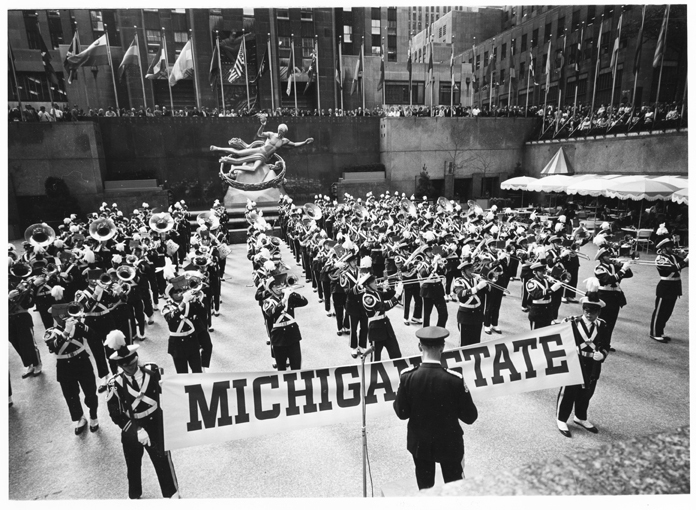 MSU’s students at the World’s Fair in 1964, performing in Rockefeller Center. the inauguration of President Lyndon B. Johnson in Washington, D.C. They also performed at the Rose Bowl in 1954, 1956, and 1966. In addition to this, they played at the World’s Fair in New York City during the year of 1964. These facts are only one testament to the MSU Marching Band’s skill, the real proof comes from seeing these dedicated musicians enter Spartan Stadium before thousands of fans. Their commitment to excellence only serves to add to the incredible MSU spirit and pride of all students and alumni in the venue.